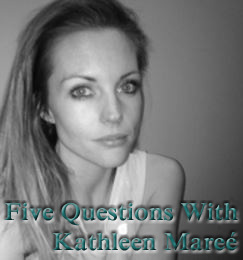 It’s been a while since we’ve had a 5Q Interview, and today I’m pleased to welcome Contemporary Romance author Kathleen Mareé. Ms. Mareé hails from Sydney, Australia and has been telling stories for as long as she can remember. As the creator of the Cut series, she takes her readers on a whirlwind emotional journey of heartbreak, love, and everything in between. Why did you start writing? I have been writing since I could pick up a pen! 🙂 I was always journaling away, or writing short little stories. I enjoyed immersing myself into my world of fiction from the time I was a young girl. What’s your favorite thing about being an author? My favourite thing about being an author is having the complete freedom to create a story. I really enjoy submersing myself in my characters journey and having the creative power to decide how their journey will play out and where they will end up. Have you read anything fantastic lately? I recently read Kaleidoscope Hearts, by Clare Contreras and loved the story. Beautiful flow, emotion and love – was a really enjoyable read. I do blog about my recent reads on my website, kathleenmaree.weebly.com – come and check it out! I always love hearing about new authors and books to read! What can readers expect from your books? Readers can expect emotion and a journey. I like creating stories that you will feel. Whether they are going through pain, love, loss or happiness – the emotional journey and having characters that grab you. Anything new you’d like to share? I have just released my debut novel, Cut, with its follow up Battlescars due out at the end of the year. Please look me up on Goodreads, or follow my blog – I love sharing my publishing journey, as well as books I enjoy reading and love hearing from fellow fiction lovers. If you are a blog please get in touch, as I am always looking for reviewers for my work and enjoy sharing your book posts with my followers. This section features interviews with writerly friends from the Goodreads group Read Romance, Write Romance.